Across Oregon, schools have seen an increase in teen stress, anxiety and suicide. To help students learn to deal with pressure and strong emotions, Gardiner Middle School has added a new social/emotional learning program to advisory classes. The program is underpinned by the latest research in adolescent brain development and social psychology and has been refined via pilot programs across the nation. Topics covered in the curriculum include developing a growth mind-set, value-based decision-making, and resolving peer conflicts. "Our goal is not only to help students do better in school, but also in life," said Principal Michael Sweeten. Karen Hankins, a fourth-grade teacher at Gaffney Lane, knows how important it is for each child to be included in classroom learning, regardless of a child's disability. New technologies and strategies now make it possible to address individual needs in classrooms across Oregon City. Teachers wear small microphones with speakers for students who have limited hearing. Computers with speech-to-text software can help students who face writing or typing challenges. Children with movement limitations can join in playground fun using an extender to draw with sidewalk chalk. 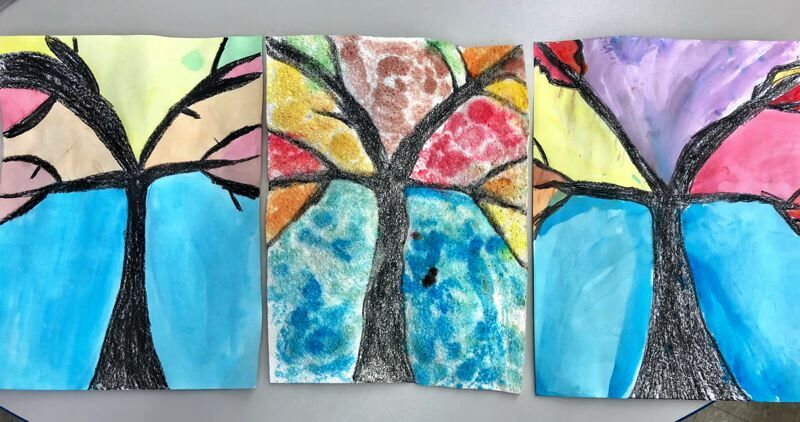 "My student who is blind painted like everyone else today because of this special sponge paper that puffs up when you wet it so he could feel where to paint," Hankins said. "He had so much fun being a fourth-grade artist today. This is the greatest thing ever, and I'm so excited." Kraxberger Middle School is on a mission to help each student find a place to connect and belong. A keystone of this effort is expansion of the school's after-school clubs and activities. While teachers have stepped up to staff the fall session, the school is recruiting parents and other volunteers to lead activities this winter and spring. "This is an opportunity for talented parents and community members to share their passion or hobby with a small group of students," said Principal Len Reed. "We are open to a range of activities from dance, crafts and chess to basketball, knitting, cooking or running." Clubs run four to six weeks and meet once or twice each week from 3:20 to 4:20 p.m. on Mondays, Tuesdays or Thursdays. Snacks and late buses will be provided, and participation is free. Session 2 runs Nov. 26 to Dec. 21, followed by Session 3 from Jan. 14 to Feb. 22. The Gladstone Center for Children and Families plans a seminar for early childhood professionals on building children's resilience through early learning. The seminar welcomes participation from preschool and day care employees, primary teachers and early childhood program directors. Presentations will be offered in English and in Spanish. The event will take place from 7:30 a.m. to 2:15 p.m. Saturday, Oct. 27, at 18905 Portland Ave., Gladstone. The cost to participate is $20, including breakfast and lunch. To register, visit clackesd.org. Vanessa Mohler, a second-grade teacher at Holcomb Elementary, used part of her summer break to write grants that will fund classroom projects. She received a $2,500 grant to fund computers and a robot from Farmers Insurance Thank America's Teacher program. These will be used to teach keyboarding, coding, research and practicing basic academic skills. A $500 grant from Walmart also will be used to purchase computers for the project. In September, students at John Wetten Elementary had the opportunity to spend time with children's advocate and award-winning author Trudy Ludwig. Ludwig has been featured on ABC's "Good Morning America," PBS's nationally syndicated show, "Keeping Kids Healthy," the Wall Street Journal, Huffington Post, Reading Rainbow, the National Crime Prevention Council's Circle of Respect program, and has served as an expert panel member on Sesame Workshop's video series addressing bullying. She is the author of "My Secret Bully," "Just Kidding," "Sorry!," "Too Perfect," "Confessions of a Former Bully" and other books. Her books have received national praise for helping children connect and engage with their peers in kind, caring ways. In each of her three student assemblies, Ludwig read one of her books to the audience and discussed the story and the characters' roles. Through engaging, age-appropriate activities and role-play with the author, the students learned important life skills related to making healthy friendship choices. Preschool and kindergarten students at the Gladstone Center for Children and Families have fresh celery and tomatoes for lunch, thanks to the efforts of Easter Seals volunteer Susie Chapman. Chapman has kept the school garden growing at GCCF since April, taking care of planting, weeding and watering. The garden provided produce for the free summer lunch program and now the school lunch program. Any extra produce was shared with families. "The children love eating what they see growing," said head cook Lynn Aleksich. "The celery is amazing, the cherry tomatoes on every lunch tray is a sight to see for sure. The variety that has been growing is wonderful for the students to try new foods."